A man has died after his car collided with another vehicle on an exit slip road and then rolled down an embankment on to a major dual carriageway. A Nissan and a Vauxhall collided on the exit slip road from Lubbesthorpe Way in Leicester at 20:16 GMT on Saturday, police said. The Nissan then rolled down the grass embankment and came to rest on the main road leading to the west of the city. Its driver, a 44-year-old from Leicester, died at the scene. The driver and passenger in the Vauxhall were not injured and no other vehicles were involved, Leicestershire Police said. 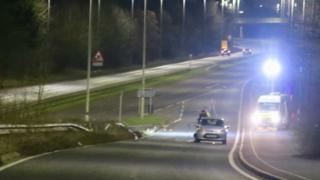 Both cars had been travelling northbound towards the A47 and used the exit slip road for Meridian Leisure Park.